Posted on March 21, 2019 by Matthew Leib. This entry was posted in Spotlight, Staff Stories and tagged Be the Match, Spotlight, staff story. Bookmark the permalink. Over the course of his career, Joe Grojean has navigated some dangerous situations and extreme conditions. There was that time as a Peace Corps volunteer in Burundi when he had to be airlifted home with a broken leg after an errant taxi swiped him off his motorcycle. Or that job at a military base on the remote Johnston Atoll in the South Pacific safely disposing of chemical weapons such as nerve agent and mustard gas. Or the six months prior that Grojean spent living and working in Antarctica as a hazardous chemicals specialist at the McMurdo research station. 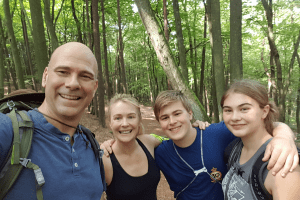 Grojean’s itinerant work schedule has settled down somewhat in recent years—though he and his family recently moved back to Washington after a year living Germany. 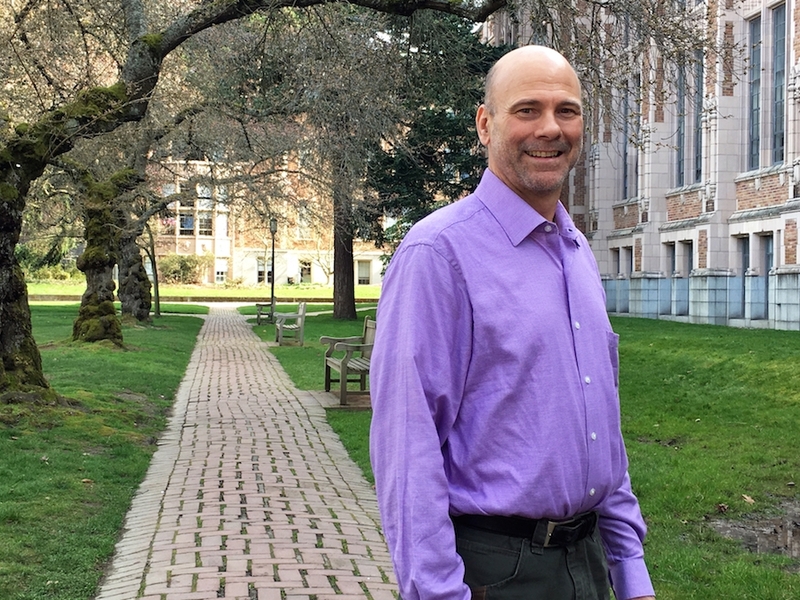 Stateside, he’s served two stints at the University of Washington, most recently as Hazard Assessment Coordinator, a job that involves identifying, evaluating, and controlling physical and chemical hazards in and around the University. That extends to protecting workers involved with fall protection or confined space entry as well as anything involving scaffolds, excavations, noise, electrical hazards, heat and cold stress, to name just a few. On Tuesday, March 19, however, Grojean was front and center as a guest speaker at The Whole U’s annual Ambassador luncheon to share the story of his most perilous workplace encounter: cancer. Before working at the UW, Grojean served as a contractor with the EPA, working around hazardous materials as he had often done after an undergraduate degree in marine science propelled him into the field. At an annual physical, he learned his blood counts were lower than they should have been. After shuffling through doctors, he met one who decided to perform a bone marrow draw. That’s when he learned he had developed myelodysplastic syndrome (MDS), a condition that can occur when the blood-forming cells in the bone marrow do not mature. In 15 minutes, the doctor laid Grojean’s life before him: if the MDS were allowed to progress, it would turn into leukemia and certain death. “He told me there’s several treatment options, but if I didn’t get treatment I would be dead within 6-18 months,” Grojean says. After taking a month to spend the Christmas season celebrating life with family and friends, Joe began getting ready for chemotherapy. He remembers his outlook at the time as happy and hopeful, even as doctors prepared to destroy his blood—one of the most aggressive cancer treatments a body can undergo. After a month of chemotherapy, he returned home tired and exhausted, his immune system depleted to the point where the tiniest scratch from his dog sent him back to UWMC with an infection that lasted two months. 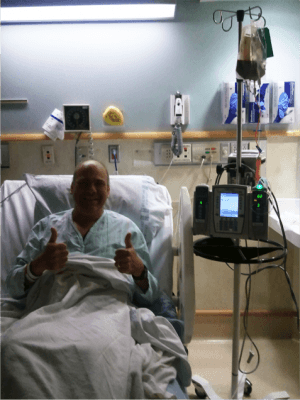 After fighting numerous other infections and finally becoming stable, a genetic stem cell match was identified through the bone marrow registry. “My brothers are a match for each other but not for me,” Grojean says, adding that the Gift of Life registry found someone whose stem cells were a match. He recalls his doctor, Dr. Bart Scott, whose specialty is MDS reoccurrence, being visibly upset. “He said, ‘You must think I’m the angel of death.’ I said, ‘No, you are my guardian angel. I should be dead right now. '” Scott told Grojean there would be fewer options the second time around. They also found another stem cell donor. This time, the transplant was a complete success. Stem cells introduced to the blood system find their way to the bone marrow and start growing and reproducing. Joe began his slow journey of recovery with his blood counts slowly getting back to normal. Then, 11 months later, he received a letter from his donor: a 26-year-old from New York City who had happened to attend a walk-for-rights march decided to swab his cheek and join a registry as a possible stem cell donator. 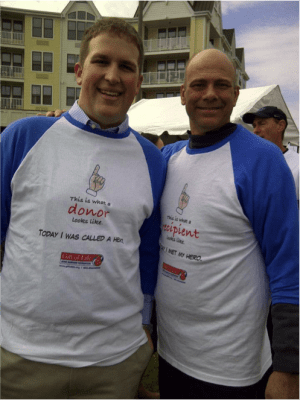 Six months later, they harvested his life-saving stem cells to be transplanted into Joe. For Grojean, the donation was not just life-saving, but also life-changing. In early 2013, Grojean was given a clean bill of health. He was cancer free and something of a medical miracle by surviving the odds and not being on any medications. Shortly thereafter, he joined the UW as senior industrial hygienist. The power of a positive outlook is no small thing for Grojean. It’s part of what helped him beat cancer. But that wasn’t all. People he hardly knew came out of the woodwork to support him and his family during his periods of treatment and recovery. What can strangers do to play a pivotal role in helping people like Joe push through? People can also get their cheek swabbed as part of UW’s groundbreaking partnership with Be The Match, the nation’s largest marrow registry working to cure rare blood cancers. Hear Joe and other UW faculty, staff, and students speak from their experience on April 17 at the HUB. Register here. or Text CURE16 to 61474. Learn more about UW’s groundbreaking partnership and upcoming ways to get involved here.